Presented by World Of Pes 2018 PS4 Community founded in 2012 and based on the creation of major and minor leagues in Pro Evolution Soccer. Every day we try to always produce the best to satisfy many of your requests. You are so many and this makes us happy. Keep following us. Below here is the link of our last option file project still under construction. - Inserted and corrected kits to all C-Series teams. A + C-Series C-Series C + C-Series B-Series. - The missing patches are included in the Kits. Is the c-series v4 option file compatible with the pes team patch? It is compatible except for those championships that will be replaced. Oldflosky, Peppe83, Lukino71, Brave92 and I have completed the kits. Terras completed Lecce. Pordenone has been inserted and completed. A special thanks to Dutur for the skills of the Serie C teams. 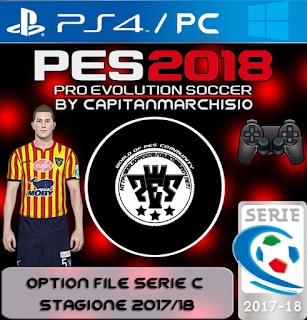 In v4 the stats and the correct names of all the Serie C teams, abilities and faces have been released. Note: if you find more than one crash in games or when importing files, when you select teams import up to 20 at a time, then exit Edit mode, save, and restart the game.